When we arrived on the mountain, we saw Teton and the rest of her family resting near the pond. A little while later, Stiles came out of the forest and challenged Teton a little. This caused Teton to move the family up a little higher. Since the family looked content at this new place, we went ahead to see if we could find any other horses before Phoenix and the foal arrived. It isn’t so unexpected that we did not see any other horses besides Teton’s family as the horses have moved to some remote areas lately. It is very lucky that Teton’s family happened to be near the road on the day Phoenix and the foal were to return. Again, the BLM’s plan had always been to release them very close to Teton’s family when there wasn’t any other families around that could complicate the return. This would allow for the most stable of situations. The situation could not have been much more stable today. We met up with the BLM horse and burro expert with Phoenix and the foal, and followed him in. It was about 12:30 by the time we reached the hillside with her family. As the trailer was backed just off the road, Teton and his family became alert and watched. As soon as the trailer was positioned below the family, Phoenix and the foal were released. They ran away from the trailer, smelling the air. 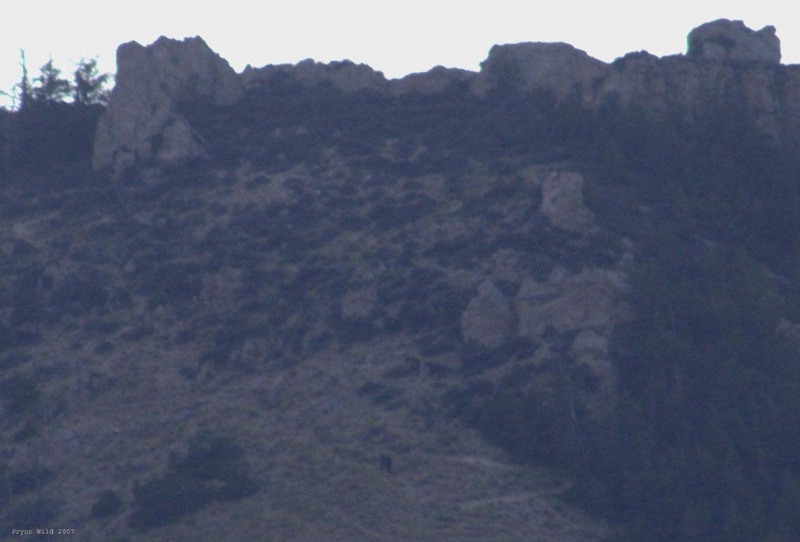 As they got closer to Teton, they started to call out to him. Teton and the dun mare quickly ran out to her, and the two year old colt was close behind. As the family ran out to Phoenix, Stiles ran up to challenge Teton again. The two sparred a little before Stiles moved away. After this, the family was able to be together and graze for a short while. Phoenix and the foal seemed to quickly readjust to life back on the mountain. After grazing for a little while, they all went down to water. Phoenix has resumed her role as lead mare, and she led them down with the dun mare and her foal right behind. Teton and the two year old colt took up the rear. They drank and played in the water for a few minutes. After that, Phoenix led the family out into the woods north of the pond, and Stiles was close behind. It was about twenty minutes from the time Phoenix was released to the time the family moved into the forest. I was taking most of my photographs from adjacent forestland, so I didn’t interrupt the family. Thus, it was difficult to get real clear photographs of her wound. Here are a couple cropped down shots of it from when she was running out of the trailer. 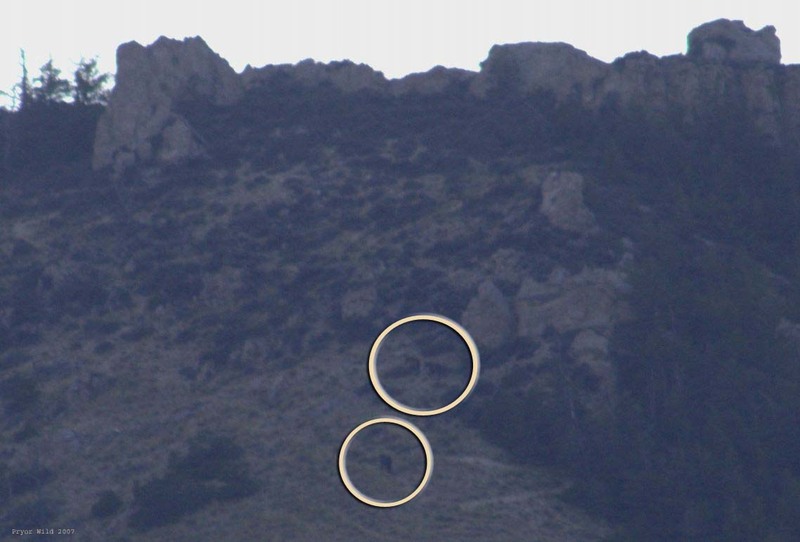 As I have mentioned, finding the mountain horses is a lot harder now than it was just a few weeks ago. The only other family I ended up seeing was that of Coronado (Red Raven) as they came to drink at the pond. I hope to get back up there soon to do some exploring and see how the other horses are doing. Tonight I finally was able to find Sam and his dun mare that we call Hightail. It is embarrassing – I am sure they were always in this area, but I didn’t really want to go exploring in there until I knew they were there for sure. Again, I wanted to find the dun mare because I had heard from others that she has a “hole” on the side of her back left hip. After hiking through the vegetation, and crossing Crooked Creek, my dad and I caught up to them. As you can see, Hightail has excellent primitive markings (the stripes on her legs and back). The small puncture wound can be seen on her hip, but it seems to be healing quite well. Here are a couple of cropped down closeups of it. I will continue to post updated pictures of her when I can. Also, it looks as if her stallion, Sam, had a big fight sometime this season. The white stripe on his back and the white area in front of his back right leg are scars. As a side note, Crooked Creek provides habitat for other animals besides the Pryor horses. The constant source of water and dense vegetation also allows animals like this doe and fawn to live there. Viewing the Pryor horses in Bighorn Canyon can often be fairly easy as the horses are often within 100 yards or so of the highway. However, there are times when it may seem like there just aren’t any horses where you would expect them, especially on Mustang Flats. In all my trips to the flats, there have only been a couple when I can honestly admit that there were no horses to be seen. Most of the times, however, it just takes some serious watching. Tonight was one of these times. Though the horses are most often on the flats of Mustang Flats, they can be about anywhere in view from the highway. For example, tonight while scanning the mountainside, I ended up seeing four horses that are among the more elusive of the Dryhead horses: Corona and his family and the old bachelor stallion Pepy. This is the area that I spotted them in. 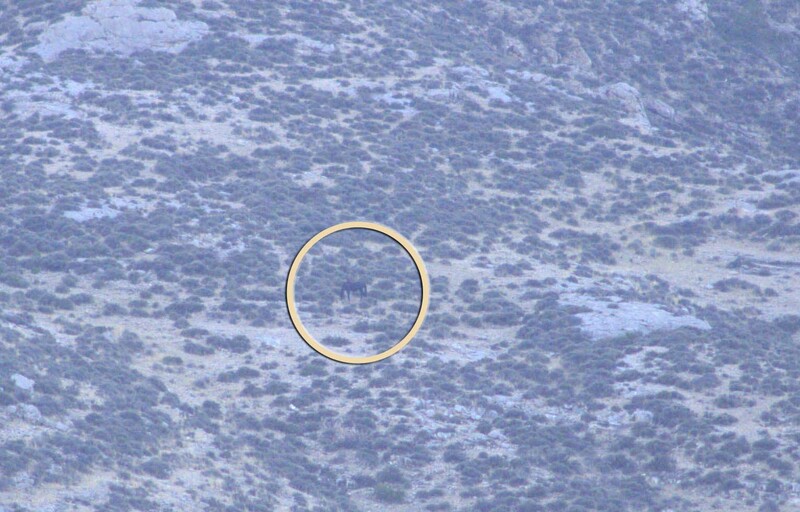 Clicking here, you will be able to see where on the mountainside these horses were. Zooming in further to Corona’s family, you can make them out moving up a trail. Here you can see where Corona, his mare, and his filly foal from this year are. A closeup of Pepy can be seen here, and his location in that picture can be seen here. Mustang Flats is actually a pretty large area, and so it is worth scanning it all too in order to find horses. This especially holds true for the area near the foot of the mountain. Tonight, Seattle and his family were there. 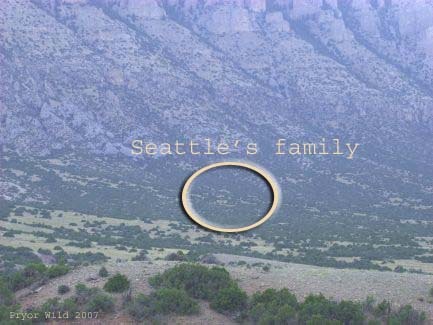 Clicking here will help you to see the area that Seattle’s family was in. The black stallion Seattle is the easiest to spot in this photograph. The area the family was in is highlighted here. His grulla family is almost impossible to see around Seattle, but I did see them to verify it was that family. If you are planning a trip out to see the Pryor horses, I’d definitely recommend bringing a good set of binoculars so you can do this kind of searching. It’s really fun to be scanning along and then see horses in your view. To make identification at this distance possible, I have also put together a guide that makes it easier. Until I can get a version of it uploaded to this blog, feel free to contact the Pryor Mountain Wild Mustang Center or stop on in for a printed version of it. For the past few days I have been going to Bighorn Canyon a lot to try and find a particular mare. A couple visitors to the mustang center have told me she has an injury, and I would like to see it myself. I still haven’t had any luck, but a visitor this morning saw her; and so I hope she is still there this afternoon. These trips out there haven’t been a waste at all, though, as the horses out there are always a pleasure to see. On the evening of August 24, 2007, I saw Blizzard and his mare heading to water. Blizzard is Durango’s son; he is six years old this summer. Blizzard’s grulla roan mare is the mother of the blue roan two year old bachelor who is with the other Dryhead bachelors. The bachelors were nearby as these two went to water. On the morning of August 25, 2007, it was a little chilly in the canyon; and the horses were up pretty high. I did see a golden eagle on the way out, though. Durango’s family was resting on the morning of August 26, 2007. The colt was laying in some grass while the rest of his family stood together above him. Just down the road from them, the bachelors were grazing together. Seattle’s family was also nearby. One of his mares, her two year old colt, her new colt foal, and the filly foal from the family were together. The lead mare stood on the hill watching them. 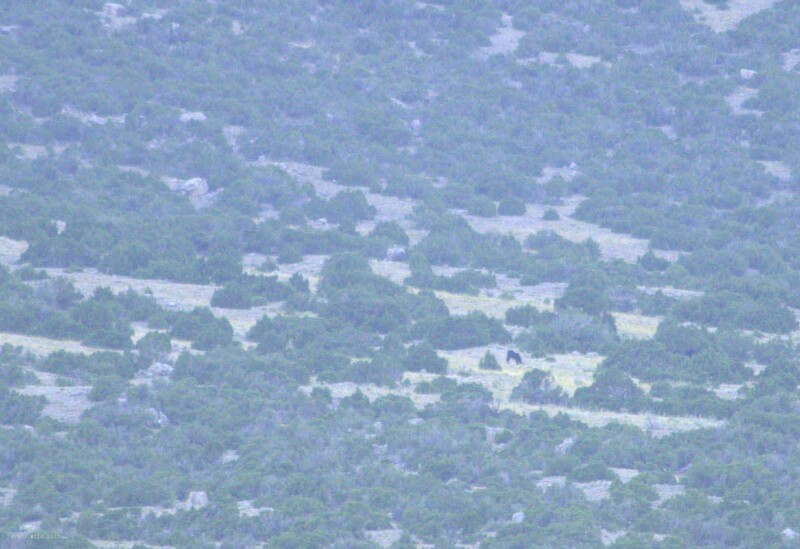 Seattle was trying to get some sleep; his other mare can be seen above him in the junipers. A few minutes later, the family seemed to decide they would go pester Seattle. The foals nuzzled and bit him while the mares stood over him. After a few minutes, they stopped bothering Seattle and ended up resting with him. On the evening August 27, 2007, I still could not find that mare. I ended up seeing Durango and his family as they went to water. I also saw a number of deer, I think I ended up seeing about 8 of them. On my way out, Admiral’s family was near Crooked Creek Bay. Initially the three were resting. Soon after, though, they moved into a nearby field of sunflowers. Admiral’s mare and her yearling were side by side, and their great stripes were very visible then. The yearling looks like a miniature version of her mom. This mare is also the mother of the bay bachelor with the tomahawk shaped blaze. Hopefully I’ll be able to find the mare with the injury soon, I’ll be sure to write about anything I find with her.